474 Cooper Street. February 2014. Although many of them have been converted into apartments for decades, Centretown remains home to a large number of stately homes, constructed during the Victorian, Edwardian (VII), and early Georgian (V) periods. Of course, it wasn’t the working-class families of Lebreton Flats or Eastview constructing these homes to live in. 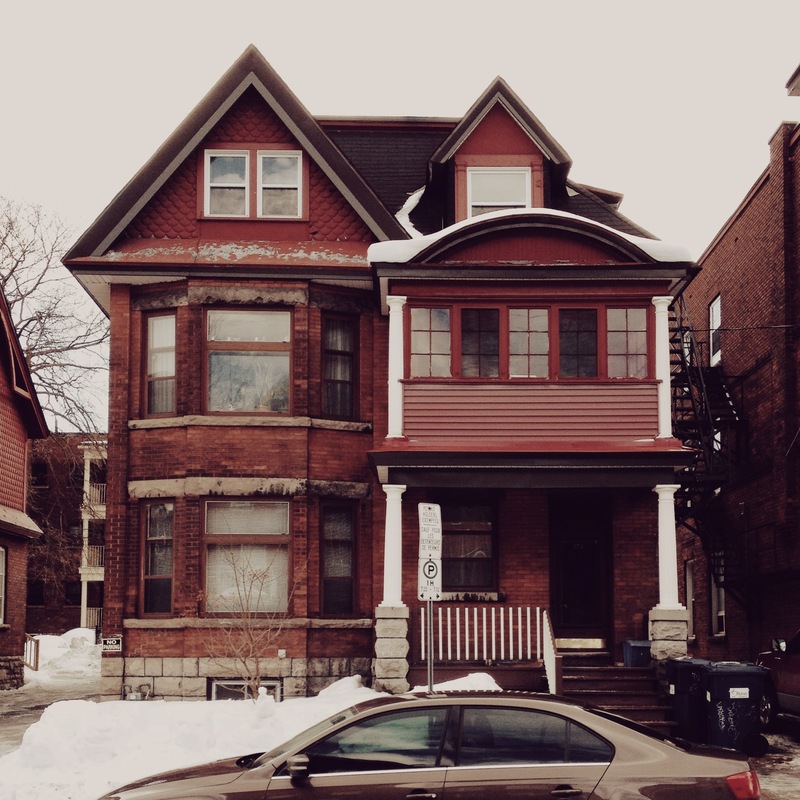 It was Ottawa’s then burgeoning commercial class and the few well-positioned, well-paid members of the Inside Service taking up residence in these homes. Pictured above is the home at 474 Cooper Street, just a few lots west of Kent. Although quite beautiful (if in need of a little care), it is a pretty standard design for the time and, if I had to guess, was likely (or largely) sourced from an existing pattern book. Following their honeymoon, Robert and [NAME] returned to Ottawa, staying in the Hotel Cecil. Source: Ottawa Journal, December 20, 1909. After six months in the Cecil, they were able to move into their new home. Source: Ottawa Journal, May 2, 1910.Robert Nathaniel Bates was born at Prescott in 1881 to Joseph and Juliet (Lighthall) Bates. Robert married Mabel Asquith in 1909 and for a time took up residence in the Hotel Cecil on Sparks. The newlyweds needed a nest, however. Once construction was completed in 1910, they moved in to their home at No. 474 Cooper. It appears that it was a reasonably straightforward purchase: Bates was earning $5000 a year at the time. Crown’s short-lived success. I haven’t found any other mention of the company. Source: Ottawa Journal, February 17, 1909. As with a number of entrepreneurial families, the Bates’ were involved in a number of enterprises. Robert and his father Joseph, for example, founded and ran the Crown Oil & Gas Company, enjoying some limited success in 1909 in oil and gas exploration. It appears that 1909 would it its only real notable year, however. The company is not mentioned again in the local papers, although Crown’s activities were later continued. In any event, both Robert and his father seem to have had other, much larger, plans. Robert Bate was also president of the Electric Bean Chemical Company. Source: Ottawa Journal, June 24, 1911. First and, perhaps most interestingly, Bates entered the patent medicine game in 1907 selling “Electric Beans”, seemingly iron supplements, which promised to energize and vitalize the listless. A half-page ad published in local newspapers offered a narrative of how scientists discovered this plant material that energized the blood and – miracle upon miracles – those who take the beans experienced a whole new life and a rosy glow to go with it. 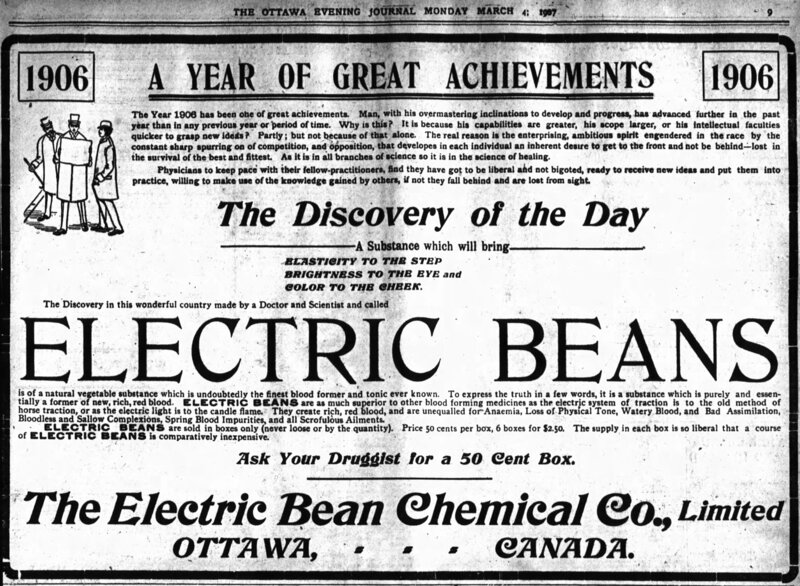 Electric Beans are what rendered 1906 “A Year of Great Achievements.” Source: Ottawa Journal, March 4, 1907. 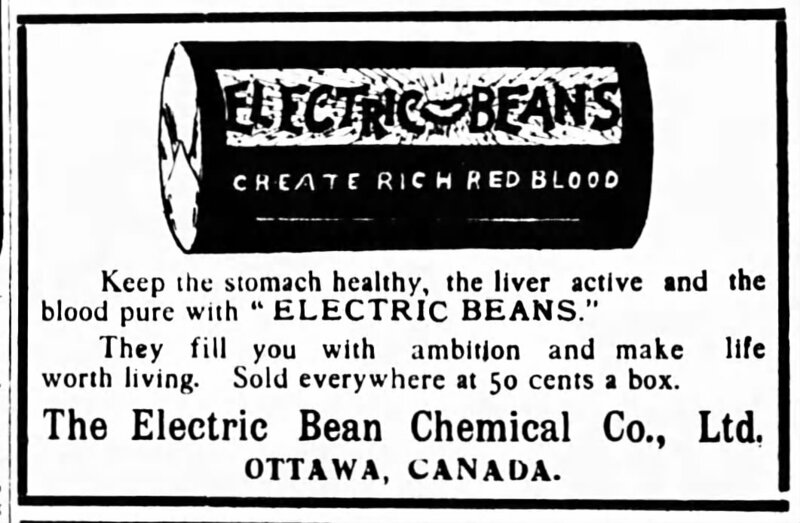 Advertisements for these Electric Beans were run in the Ottawa Journal until 1918 and materials were published directly by the Electric Bean Chemical Company until at least 1920. It appears that Electric Beans were merely a sideline or a single act for Robert. Along with his father, it appears that they had more conglomerate aims. Feel the pulse. My favourite Electric Bean ad: “They will fill you with ambition and make life worth living.” Source: Ottawa Journal, December 14, 1907. Advertisement in Canadian Druggist. Electric Beans weren’t the only medicinal product in the company’s catalogue. “Electric” appears to be the Edwardian/Georgian equivalent to “Extreme”, “Pro”, or “i”. Source: Canadian Druggist, January 1911. In the summer of 1910, Robert and his father formed the British Canadian Industrial Co. Ltd. British Canadian appears to have been largely an attempt to bring all their different activities into a single incorporated body, not the least of which the Electric Beans and oil and gas properties. This would also help them to raise capital. Invest in British Canadian as a whole or in the Electric Beans specifically. Your choice. Source: Ottawa Journal, November 23, 1910. British Canadian’s future looked bright in those early days. After their first year, expansion plans were made. 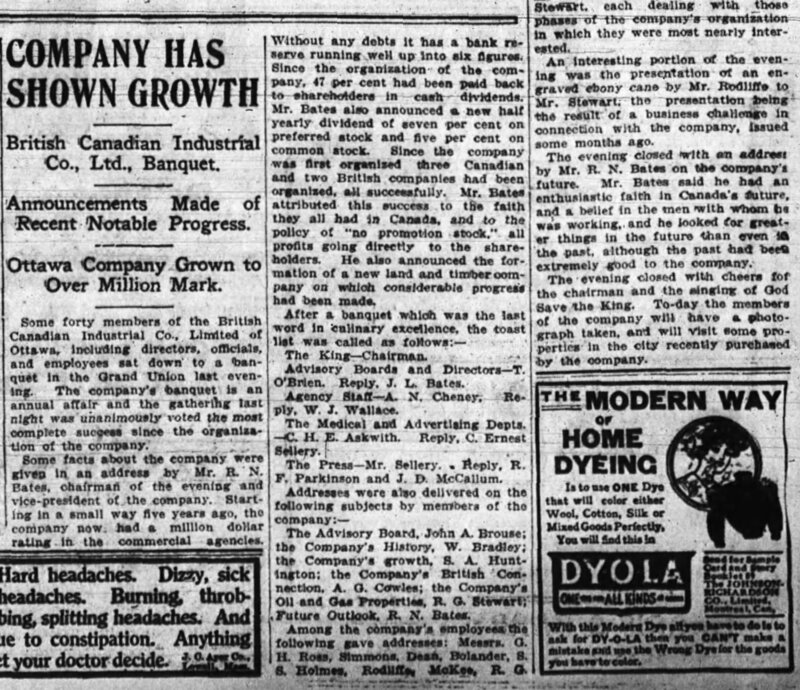 Source: Ottawa Journal, May 23, 1911.Not three months later, British Canadian’s new business was announced. 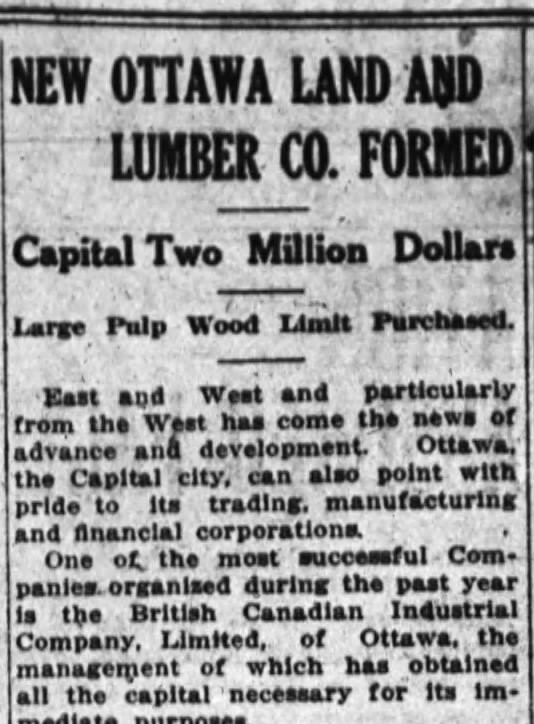 Fitting for an Ottawa business, British Canadian created a whole new company (with a $2,000,000 capitalization) called the International Land and Lumber Company. Throughout the year, Bates had been raising funds, both domestically and internationally, in order to purchase a timber limit around Lac St-Jean, Quebec. On July 24, the birth of International Land and Lumber was announced. Source: Ottawa Journal, July 24, 1911. 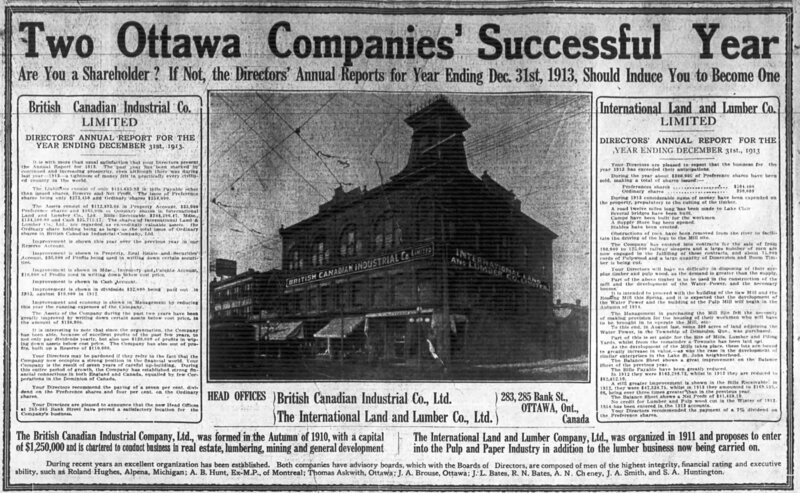 For a time, it appeared as if British Canadian and the International Land and Lumber Company were going to become a significant corporate presence in Ottawa, Canada, and even noted abroad. Robert had been tremendously successful in raising funds, making contacts, and interesting some important persons. Within three years, both Bates-run companies had grown considerably. 1914 seems to have been a good year for the Bates’ enterprises. The pictured headquarters was actually a new facility. A fire at their former premises at 226-228 Albert in the previous year left British Canadian and International Land (among a number of other notable Ottawa companies) homeless. 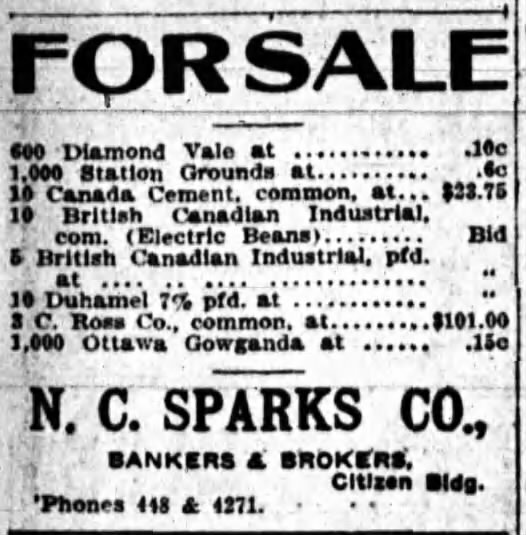 Source: Ottawa Journal, April 29, 1914. While under the control of Robert Bates, it appeared that the sky was the limit. That is, of course, where the story takes a turn. Robert Bates: passed away at 38 years old while away on business in London. Source: Ottawa Journal, March 4, 1920. In March of 1920, local papers reported that Robert had died while away on business in London (UK). While his cause of death does not appear to have been published, his entry into Beechwood Cemetery registers lists the cause of death as asphyxiation. He was just under 39 years old, clearly with much ahead of him. Beechwood listed his cause of death as asphyxiation. Source: Beechwood Cemetery Registers (Ancestry.ca). From there, the wheels began to come off British Canadian and International Land. In 1921, high-ranking corporate officer S. A. Huntington departed for Leamington, ON to establish a fruit farm. Two years following, the Toronto General Trusts Corporation, trustee for the International Land and Lumber Company’s bondholders began to investigate the company’s affairs. International defaulted on its bond interest payments in 1923. Source: Ottawa Journal, November 20, 1923. Toronto General Trusts’ investigation uncovered that much of Bates’ fundraising energies – aside from his work in England – were focused on investors of modest means in rural Eastern Ontario and Quebec. Once the company’s larger debts were paid (the investors in England, the Government of Quebec), it did not appear to be good news on the horizon for these smaller investors. 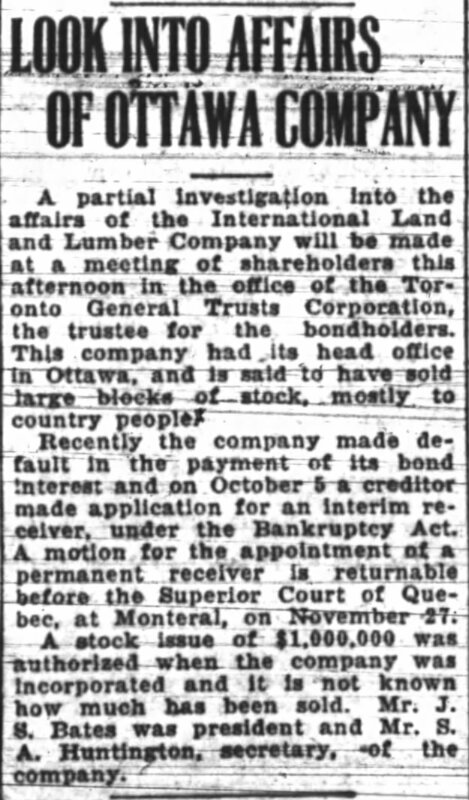 Details of the International Land and Lumber Co’s position in 1923. Source: Ottawa Journal, November 21, 1923. The following year, in 1924, the company began bankruptcy proceedings in earnest. With that, it was all gone. Today, very little of any physical reminder of Bates’ entrepreneurial life exists. Neither office building is standing (both burned), and neither is his home at death, 248 O’Connor. His first home, at 474 Cooper, however, remains standing and truly is one built on the strength of Electric Beans.